An excellent way to make your home feel like new again is to change up your furniture. Buying a whole new set of furniture can be quite expensive, but you do not have to count on that financial stress. Instead, focus on what you can do with your existing furniture or what you can buy for cheap at a second-hand store. There are countless ways you can change your furniture so that it feels like an entirely new space to both yourself and your guests. Painting is one of the most obvious and easiest choices to what you can do to your existing furniture. If you look into secondhand stores, you will be able to find many options that may fit your home. Secondhand stores are also great because it gives your furniture an antique feel. Pick a color theme that matches your home or use this as a chance to make something pop out. If you are artistically inclined, feel free to add in some patterns or multiple colors. Here are some tips on painting to ensure a quality job even for those who may not be the best for DIY projects. – First wipe down the furniture so that you are not painting over any dust or unwanted areas. – Use tape to section off areas and also to make for clean cut lines. – Look for inspiration online of what other people have done in both colors and patterns. This will make the piece of furniture a homey feel and will be a great way to show off your artistic talents. 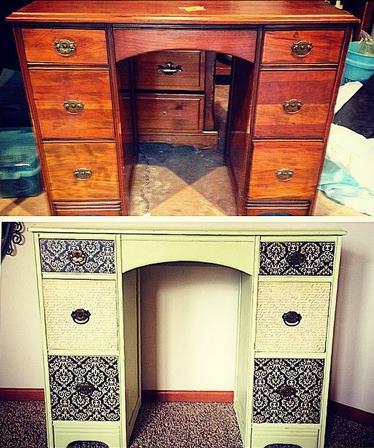 Re-painting the piece of furniture will make it look like new. Adding some fabric to your chairs, sofas, or tables can be the best little addition to make things stand out on a small budget. This can be as simple as rotating through tablecloths over the month and putting a covering over your couch, to something a little more permanent. If you are good with fabrics and sewing skills, you can make your cushion and seat coverings. Seat coverings are easy as long as you have a staple gun. Once you center the fabric on the seat and align the pattern, all you need to do is pull the fabric as you staple it onto the furniture. Here is where you can use your creativity. Look around your house and find things that you may not want anymore or things that you do not often use but would like to see them put to good use. Once you have a good pile, begin brainstorming how you may be able to put things together. For example, a few antique teapots can be used to form the base of the lamp. An old globe can be cut into half and used as a lampshade. You can always use books to build up a shelf or small table, or wine corks to make a wine holder. There are countless creative ideas that you can start to form, and the easiest way to start is to sit down and write down what you have and then what you need around the house. Carve out time each week or month to work on these DIY projects and see it as a way to relax and let the creative side of you come out for your home!